French Socialist Party Splits: Emmanuel Maurel and his left leave. This Friday France’s Parti Socialiste, (PS) which until 2017 under President François Hollande had a working majority in the country’s Parliament, left his historic HQ in the rue de Solférino near to the National Assembly for more modest premises just outside Paris in Ivry-sur-Seine. In 2017 their candidate for the French Presidential election, Benoît Hamon, came 5th and won a tiny, 6,36% of the vote. Both before and after the contest a whole swathe of Socialists joined the victor, now President, Emmanuel Macron’s La République En Marche. In the legislative elections of that followed they had got only 7,5% of the national ballots, and 30 MPs. Hamon left the PS and created his own, radical green left movement, Génération.s. The former Prime Minister Manuel Valls went so far as to leave France and is now seeking office in Barcelona. The present Macron PM, Edouard Philippe’s Cabinet counts a number of one time Socialist party figures, , such as the Minister of foreign affairs, Jean-Yves Le Drian, although the former PS Minister of the Interior, Gérard Collomb, has recently reigned. Only 37 000 members (out of the already shrunken 42,300) took part in the vote for this year’s Parti Socialiste Congress. Under their present General Secretary, Olivier Faure, the PS been unable to define a new strategy to fight back into a position of influence on the French left. Now the face a new challenge. The organisation has haemorrhaged again with the break away of one of their left-wing leaders, the MEP Emmanuel Maurel who ran the party current, Maintenant La Gauche which obtained 18.8% of the the ballots in internal PS elections earlier this year. Emmanuel Maurel : « Ce n’est pas un départ du PS, c’est une scission » reports Le Monde today. In announcing that the Parti Socialiste no longer corresponds to his idea of socialism Maurel stated that hundreds of local lay office holders and local councillors, as well as the senator for Paris, Marie-Noëlle Lienemann, would join him. Henceforth Maruel, whose socialism includes hostility to ‘no borders’ is looking in the direction of Jean-Luc Mélenchon and La France insoumise. There is a report in English on this site: THE MEP EMMANUEL MAUREL LEAVES THE PS. Maurel comes from the “Poperian” tendency within the Parti Socialiste. This current, led in the 1970s by Jean Poperen (1925-1997), embodied, in some eyes, a kind of statist Marxism embedded in the French republican tradition. Others, more favourable to Poperon, would point to his break with the French Communist Party and activism within both a ‘class struggle’ tradition and leading role in the decidedly non-statist Parti socialiste unifié (PSU). Putting this aspects together we get a “antilibérale, écologiste, républicaine” supporter of “socialisme décomplexé”, that is, an anti-economic liberal, green, republican unfeigned socialist. While it is hard to dislike somebody who admires Stendhal’s la Chartreuse de Parme and Baudelaire, there is a distinct ‘Euro-sceptic’ strain in Maurel. (10 choses à savoir sur Emmanuel Maurel). Recently he declared, “Je suis pour une politique de contrôle des flux migratoires, nous ne sommes pas des “no borders”. La gauche ne doit pas avoir honte de parler de nation, de frontière, de laïcité. On ne va pas laisser ça à la droite et à l’extrême droite. »(Le Monde 25.8.18) I am for the control of the the migratory flows, we are not backers of ‘no borders’. The left should not be ashamed to talk of the Nation, of Borders, and of Secularism (in the French sense, of ” laïcité’). We should not let these issues to the Right and the Far-Right. 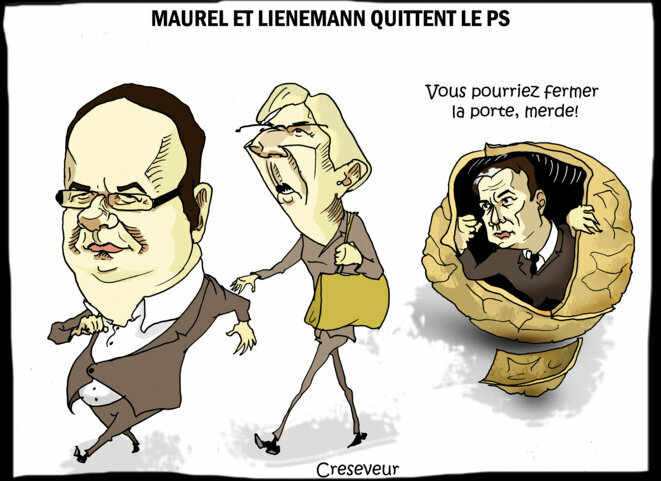 Maurel also seems to think well of Jean-Luc Mélenchon and La France insoumise (LFI) (Emmanuel Maurel quitte le PS : une double bonne nouvelle pour les « insoumis »). The central objective today, he declares is to prepare a new Front Populaire of the 21st century, “Notre objectif est de préparer le Front populaire du XXIe siècle») in which La France insoumisme has a key part to play. (Libération). He will be on the LFI lists for next year’s European elections. Whether he will accept the Leadership of the, er Leader, yes, the Leader, of La France insoumise, today’s Maurice Thorez and Léon Blum combined, is not at all certain.